Masters and Workmen. a Tale Illustrative of the Social and Moral Condition of the People. 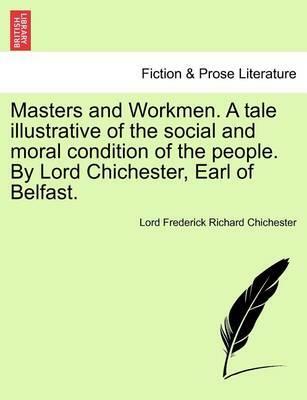 by Lord Chichester, Earl of Belfast. Title: Masters and Workmen. A tale illustrative of the social and moral condition of the people. By Lord B- [i.e. F. R. Chichester, Earl of Belfast].Publisher: British Library, Historical Print EditionsThe British Library is the national library of the United Kingdom. It is one of the world's largest research libraries holding over 150 million items in all known languages and formats: books, journals, newspapers, sound recordings, patents, maps, stamps, prints and much more. Its collections include around 14 million books, along with substantial additional collections of manuscripts and historical items dating back as far as 300 BC.The FICTION & PROSE LITERATURE collection includes books from the British Library digitised by Microsoft. The collection provides readers with a perspective of the world from some of the 18th and 19th century's most talented writers. Written for a range of audiences, these works are a treasure for any curious reader looking to see the world through the eyes of ages past. Beyond the main body of works the collection also includes song-books, comedy, and works of satire. ++++The below data was compiled from various identification fields in the bibliographic record of this title. This data is provided as an additional tool in helping to insure edition identification: ++++ British Library Chichester, Lord Frederick Richard; 1851. 3 vol. ; 8 . 12624.a.1.